It’s estimated that over 75% of bills will be paid online by 2019. 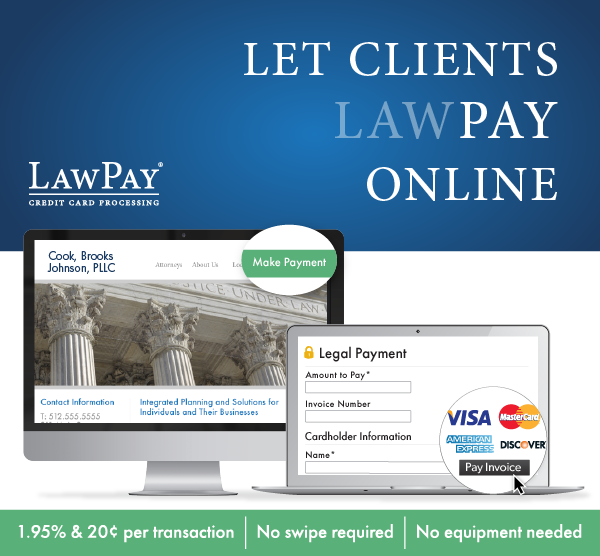 Today's legal clients not only prefer to pay by credit card, but often expect the option to pay online or by smartphone. When clients have the ability to pay at their own convenience, they are more likely to pay on time. Open a LawPay account by November 30th. We'll waive your subscription fee for 3 months! Visit LawPay or call 866.376.0950 to learn more.